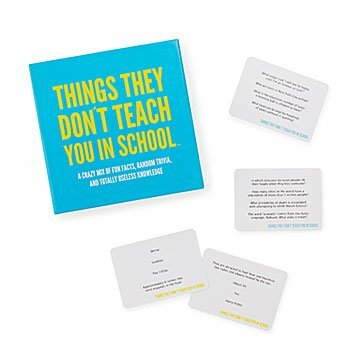 400 fun facts, random factoids, and pieces of useless knowledge make for a fresh, lively trivia game. Your edumacation may have taught you important things like what the capital of Moldova is (Chișinău) and how many signers of the Declaration of Independence weren't American-born (8). The trivia in this game starts where that fancy book learnin' stops. Why doesn't the Mona Lisa have eyebrows? In what year was shampoo invented? Why do you write Franklin D. Roosevelt and John F. Kennedy with a dot after the initial, when Harry S Truman is written without one? The info is so random that nobody is likely to have an edge, making this trivia game more suspenseful and surprise-filled than most. The 400 fun facts, random factoids, and tidbits of totally useless knowledge spark giggles and chatter in equal measure, adding up to precisely 10.724 tons o' fun. Made in Poland. This is a fun game for adults, but the box says it is for ages 17+. It is NOT ideal for ages 14+ as specified in the description. It has explicit content! played with ppl in their 20s 30s 40s and 50s all together! This game is a hoot! My grandchildren had it opened and were playing it before we even left their house. My son and his girlfriend called me and thanked me for this addicting game. They had the best time playing it together...again and again! It was a real hit!